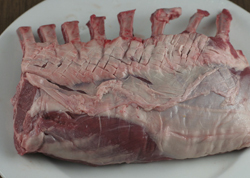 Lamb is an excellent choice of meat and easy to prepare especially when the young sheep are raised on grass as feed. 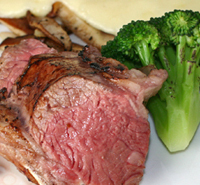 Grass-fed beef and lamb has more Omega-3 fatty acids, which reduce the risk of heart disease. 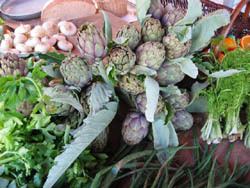 Grass-fed also contains more beta-carotene and up to five times as much conjugated linoleic acids (CLA). 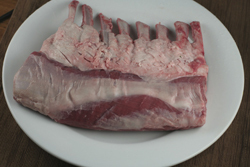 Lamb from Australia and New Zealand sell for more than half the price of American of quality lamb e.g., rack of lamb from Elysian Fields Farm sells for $160 for a 3 pound rack online at Dean and Deluca. 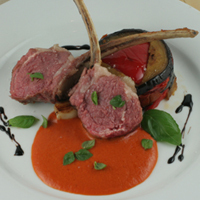 You can purchase Elysian Farm Lamb in NYC, sold under the Pure Bred label at Grace's Market and Dean and Deluca. 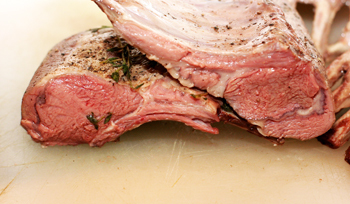 This lamb is milder than Australian and New Zealand lamb, Most agree that the lamb racks from Australia and New Zealand have a gamier taste than American style racks. 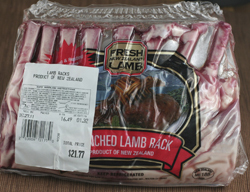 Trader Joe's Lamb (left) and Costco Rack of Lamb on Right. 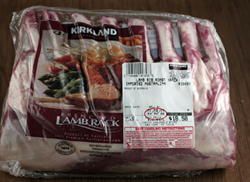 Note: A higher fat level in the Costco lamb possibly indicating a grain finishing in feeding. Both racks were cooked at 135F for 2 hours. 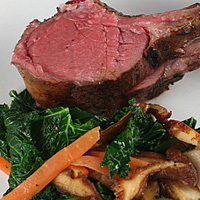 Trader Joe Sous Vide Lamb dish. ..."It is estimated that approximately 10% of lamb in Australia are completely lot fed, while around 50% or more are now receiving grain finishing or supplementary feeding (According to the Sheep Meat Council of Australia)..."source . 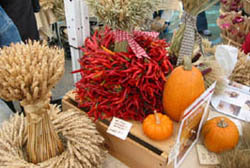 The problem with the grain finishing is that the extra weight gain is mostly fat.